An EKRE march. Wikimedia/DJ Sturm. All rights reserved.Controversies over the refugee crisis have provided the populist and more extremist right-wing parties across the ‘new’ Europe with a new impetus. This piece focuses on the case of the, relatively new and increasingly popular, party of EKRE (Estonian Conservative National Party). Estonia represents a success story in its transition from Communism: social stability, a growing economy, the overall successful management of interethnic relations, and the introduction of highly progressive E-democracy concepts (i.e. the E-stonia project). 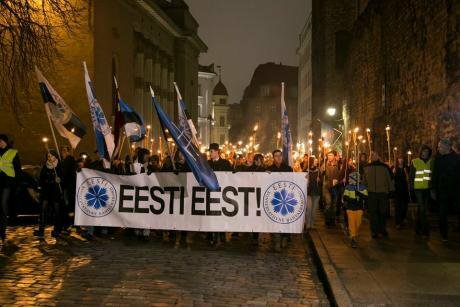 However, one should not overlook that contemporary Estonian nationalism has been entrenched into two key-notions: restoration and decolonization. Restoration refers to the continuity between the Estonian state and the interwar Eesti Vabariik (Estonian republic). Decolonization refers to the necessity to remove any vestiges of Estonia’s historical experience (or occupation) under the Soviet Union.